Add to Calendar 2018-11-03 2019-01-31 America/Toronto Ontario Power Generation Winter Festival of Lights Enjoy the Ontario Power Generation Winter Festival of Lights, Canada's foremost illumination festival in its most famous address – Niagara Falls – as we capture the magic of the holiday season.The Ontario Power Generation Winter Festival of Lights lights up Niagara Falls, Ontario with stunning colours from 3,000,000 sparkling tree lights and more than 120 animated displays. For several years, the Ontario Power Generation Niagara Falls Winter Festival of Lights has endeavored to use only LED technology in new lighting initiatives and to convert existing displays to LED. Most of the Festival’s illuminations are found along the 5 kilometre Niagara Parkway lighting area known as the Niagara Parks Winter Wonderland. It hosts the: • Dufferin Islands Displays (The Great Canadian Outdoors) • Winter Wonderland Displays • World Religions Displays The Fallsview Tourist Area contains additional displays. 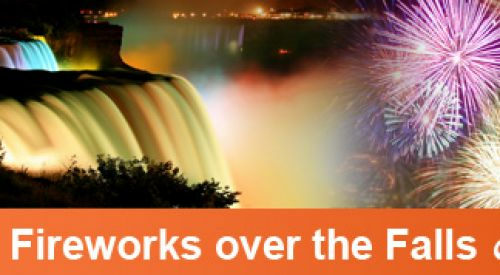 While there is no admission fee to view the illuminations, donations to this traditional Niagara Falls attraction are gratefully accepted at the exit of Dufferin Islands. Suggested donations $5 – $10 per car and $1 per person on bus tours. All proceeds are used to enhance the Festival’s lights and displays. Enjoy the Ontario Power Generation Winter Festival of Lights, Canada's foremost illumination festival in its most famous address – Niagara Falls – as we capture the magic of the holiday season.The Ontario Power Generation Winter Festival of Lights lights up Niagara Falls, Ontario with stunning colours from 3,000,000 sparkling tree lights and more than 120 animated displays. For several years, the Ontario Power Generation Niagara Falls Winter Festival of Lights has endeavored to use only LED technology in new lighting initiatives and to convert existing displays to LED. The Fallsview Tourist Area contains additional displays. While there is no admission fee to view the illuminations, donations to this traditional Niagara Falls attraction are gratefully accepted at the exit of Dufferin Islands. Suggested donations $5 – $10 per car and $1 per person on bus tours. All proceeds are used to enhance the Festival’s lights and displays.